Morning Motivation — Are you thinking outside the lines? Are you thinking outside the lines? Instead of following the predictable path—complaining, comparing, competing, being afraid, wanting more of what you don’t have, behaving the way you always have—choose to think outside the lines of the usual, choose to think differently, choose to act differently. What if you react to everything and everyone with only smiles? See what happens. What if you choose to respond in a new way? If anger is the predictable reaction, choose to sing your response instead. Why not? See what happens. Choose to view what’s in front of you with a fresh perspective, a kind attitude, a creative lens. See what happens! Everything you have in your life is full of possibility if you choose to think it does. You are full of potential if you choose to think you are. 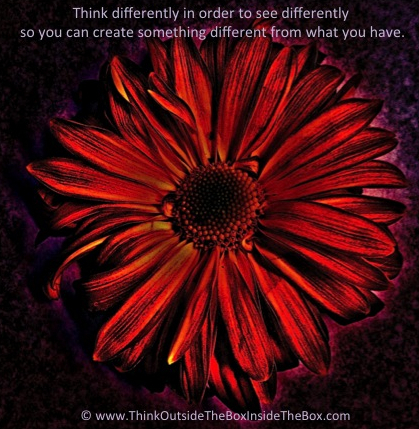 Think differently than you ever have before in order to see what you have differently so you can create something different from what you have. Think outside the lines to see the potential in everything including your self.